Certainly the best Disney movie in twenty years, and also one of the best of all time, Frozen has a great soundtrack, top-notch animation, and a heart-felt story. The animation is absolutely stunning. The choice of CGI over traditional hand-drawn works perfectly for the story here, creating a crisp look, and the gorgeous blue and white palette glistens so much like real snow and ice you'll feel a bit cold just watching. I really liked all of the characters, and felt they all had a bit of uniqueness to them. Even the relatively minor characters like the shopkeeper were memorable. My favorite character, hands down, was Olaf, who was simply so sweet and endearing as to nearly steal any scene he was in. I do wish we had seen more of Elsa, though, and that her part in the story was larger. She is a very different lady than we have seen before from Disney, and really far more interesting than her sister. Her story is far from over and continuing with her would make an excellent sequel - if Disney didn't have such an abysmal track record with sequels. That aside, this movie is a lot of fun, has really positive female characters who save themselves and each other for a change, and I'd recommend it for just about anyone. 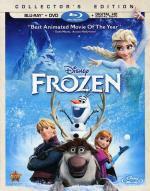 I am probably the only person on the planet that saw Frozen and thought, "Beautiful animation and good music. Story? Seriously?" In the 21 years of having these powers and trying (but often failing) to control her fear, she never felt love ONCE at least for her parents trying to help her? All that it took at the end of the movie was one phrase making her realize love was the answer, and in 20 seconds all of the devastation was gone, and her life would be perfect from now on. I may be overly technical, but that is normal for me with almost all feature animations that I watch. They can literally craft every detail as precisely as they want. As I watched it, aside from the top-notch animation, it reminded me of a $5-bin Barbie Princess movie I watched with my nieces a few years ago. I still gave it a 7/10, though. See, I thought the revelation about love wasn't about feeling love from someone else - such as her sister or her parents loving her - but was actually about learning to love herself. Since it was fear of hurting her sister/self-loathing for having hurt her sister that was responsible for her not being able to control her powers, it made the most sense that it would be inner self-love that she needed. That was my take on that part of the resolution any way. I admit the ending needed something more in explanation. That may have been the creator's take on it as well, but since it was not my first reaction, I cannot really "reason" it in to change my mind. That is a good point, though. But isn't this correct for any movie presenting us "Love's First Kiss" as solution to all problems?